When thinking of a weather station which is cheap and has exclusive features such as wireless transmission and solar power source for home use then the best weather station you should go for is the Ambient Weather WS-1200. This weather station is a solar powered device designed alongside a wireless transmitter which is accurate and reliable for reading and recording data that one needs for weather forecasting. The station has two process technologies, which is easy to install and use. The units for sensors are two, one which is the indoor unit while the other is the outdoor unit with both of them been able to transmit a frequency of 915 MHz which is displayed on the screen of the console which comes along with it. The indoor sensor unit is powered by external power supply while the outdoor is powered by solar energy. This station is designed with indoor and outdoor sensory units along with a console which displays the reading and records the data. This weather station transmits wirelessly which makes is a complete and very useful unit. This weather station has a maximum transmission of a distance of 330ft without obstructions but due to a lot of obstruction which might stay along the way, the distance coverage is shortened to about 100ft for best performance. Been made wirelessly this unit is capable of measuring temperature, relative humidity, rainfall, UV, solar radiation alongside the direction and speed of wind. It measure for both indoor and outdoor, with indoor measurement of room or indoor temperature from 32°F to 140° F, barometric pressure and humidity from 10% to 99% which is same for indoor and outdoor but the outdoor temperature range is from -40°F to 149°F. Since the indoor unit is powered by external power supply unlike the external unit which is solar powered. The indoor unit is powered with 5V Direct Current input power which is chargeable with a 120V charge which also comes with the unit with a power consumption rate of 7.5 watts. The console which is the display unit of the weather station is a colored LCD screen with measurement of 6” by 3.5” which a relatively large size plus it gets to display values for heat index, rate of rainfall, and dew point. It is able to show time and date of a particular day, sunrise and sunset time as well as the moon phrases are been displayed on this console. It is a multi-screen console which shows the measurement of both metric and imperial units as well as the parameters used for such measurement. This console has an Alarming system, with this one can set an alarm for certain conditions. The console screen is clear and easy to use and mounted on the wall or where one decides to mount it plus it updates the frequency level for different weather changes, wind speed and direction changes every 16 seconds. Graphical presentations for temperature, pressure and relative humidity are also displayed and these data can be exported with an external SD card for storage purposes. The console is slim with clear and adequate illumination which can also change based on the specific time of each day. Since this weather station is built with its own wireless connection, it does not require any addition radio frequencies or Wi-Fi connection to be able to transmit signals and data to the console, with this is able to keep its transmission process without it even with extreme weather conditions that can cut of the signals of other wireless transmitter. The console and sensory units are ease to mount and use. 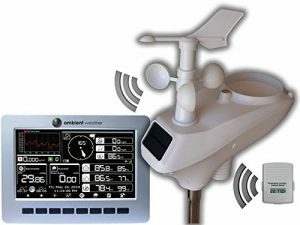 This weather station has some limitations such as, not been able to connect to a PC as the feature is not built in it, this feature which allows you to view data readings and record on your PC and also makes it able to connect to the internet is not there. It does not have any form of resistant to freezing temperatures, which makes it not recommended for use in rivalry areas or salt water areas as its durability and accuracy would be truncated. This station cannot in anyway harmonize data gotten from an external website and that gotten from the console. The Ambient Weather WS-1200 weather station is very easy to set up, been accurate, precise and reliable for weather forecasting. It is also a good choice to make when one decides to monitor weather conditions without having to spend much.